Some poker variants are more suited to casino play but there are those which are perhaps more suitable for home play and we would consider Spit In The Ocean part of that category, not least for the unsavoury name. It also falls into the category of ‘draw’ poker which means that at some point in the game players can discard their cards and replace them to try and make a stronger hand. Spit In The Ocean can be played between a minimum of two and a maximum of ten players and the aim is to create the strongest five card hand according to standard high poker rankings. To being with each player is dealt four cards face down but following that deal a single community card is placed ace up in the centre of the table. This is shared by all players and will constitute everybody’s fifth card. 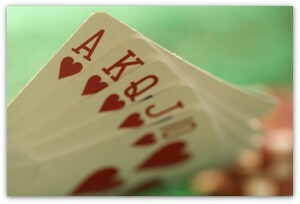 A singe draw now takes place during which players can discard and replace any, all or none of their cards to create a better hand. There’s now one more betting round after which, assuming that more than one player remains in the game, the showdown occurs and hands are compared. Spit In The Ocean lends itself to rule variations which are really only limited by the player’s creativity. One example called Wild Widow makes the community card wild along with every card in the deck of the same rank. Stormy Weather uses three face down community cards with each revealed after a betting round. Players can use just one to complete their hand.